I completely adore this game. It lets you pick your horse's breed, color, personality, and loads more. I have a lovely horse and you can buy all the gear and tack for your horse, go on peaceful rides, go to lessons, talk to friends, learn about horses by collecting horse cards on rides. It's a fab game and it is neighing with fun. I would advise you to buy it if you like horses because it is all horse fun! I really enjoyed this game. I love everything about it: plot, horses. Graphics are quality, this game has great potential. For anyone who loves horses like I do, but has a little bit of gaming in them you should try this. My brother has played it and said "It's so much fun!" i love this game, it is the best game ever. I LOVE this game, it's a must have for all horse lovers! I have a question though, is the DS game the same as the Wii and PC games? Question: Is it the same as the PC game? This game is a MUST have for horselovers. 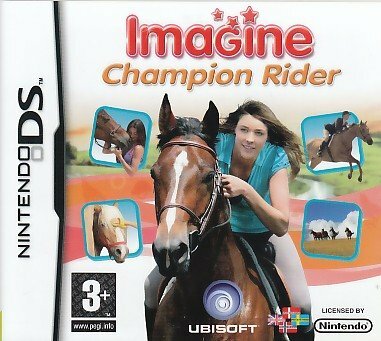 Our horsecrazygirl-friend Katie has a blog with tips for playing Imagine Champion Rider. Check it out here! you can buy it on eBay. i id. I'm getting it 2morrow! sooo excited! yeah it looks really fun but i want to download it i know its possible but how do i!? i want to play it on my computer and not buy anything how do i!!!??? I see many of you are saying it's boring after you've finished it, but its not! If you keep playing you find a wild foal which you can keep! You can also continue doing the competitions because you don't win so much after you completed it and set targets to win them all again. I love it, I've had it for over a year now and have never gotten bored of it! where can i buy this game? iv'e searched everywhere but i can't find it anywhere. Sounds great! What's the name? I love this game, it has good graphics and an interesting plot. But where do you find a wild foal? I recommend renting the game if it's quick to finish, or buy a second hand one. Unless you don't get bored easily, then you should be fine! Imagine Champion Rider is a brilliant game and unlike many other horse games it comes quite close to the reality of looking after a horse. When you first start the game you will play alongside Sue, a girl who has just moved to her Uncles horse farm. There she shows you around and gives you instructions. You will then go to the horse market and choose your horse. You can also name the horse once you have chosen the breed and color, and you can choose it's personality. You then go on to training your horse just as you would do in real life, bonding with him and gaining each others trust. In aspects of care you can muck out the stable, feed and water him, groom him, pick his hooves and give him a shower. You can check how he is feeling as often as you like. Also, you can practice for competitions and enter them when your ready:-) Then, the best part of the game is that you can raise foals and horses and capture wild horses whilst riding your horses in the mysterious forests, also, look out for collectables whilst riding through the scenery, such as cards, coins and apples! Not to mention you can win rosettes and trophies to add to the trophy and rosette cabinet! I've played the game, and it isn't rubbish! I finished this AWFUL 'game' in about an hour 20min, but I took as long as I could to make it last. I know one person who easily finished it in 40 mins. It's rubbish!I got this game after I saw the trailer and reviews for the PC version. NOTHING LIKE IT!!! 4 tiny, repetitive areas to ride, terrible graphics, and you CANNOT choose breeds. The only thing you choose is colour, which is VERY limited. It SAYS you can choose the breed, but all the horses look and act exactly the same! The rider's position is AWFUL and the horse's conformation and proportions are so terrible it would be merciful to shoot it. The few competitions are EXACTLY the same, the only thing that differs is the scenery and the length of the track. All you do is steer and jump, which you have about 5 seconds to tap an unresponsive jump way too early so that your horse leaps over air and land in the MIDDLE of the jump. APPARENTLY, you can care for your horse, but all you do is rub the hooves and coat which you only need to do half of and drag food to the trough. The gaits are AWFUL and SLOOOOW. The walk basically stands in place, the trot edges along and the canter is like a slow trot. A VERY slow trot. You don't find and tame wild horses, the only 'wild' horse you see is a black stallion that you can apparently just throw tack on and ride ONCE just like an old school pony. Then you never see him again. Don't do what I did. Don't get this game. You will regret it.